Everything. The staff is kind, especially Nicole. Specifically, I lost my card holder, and she did everything she can to help me. Aslo, the breakfast is perfect. More importantly, the scenery is super beautiful. It was an amazing room with great facilities. The staff were very helpful and nice. We had an amazing view from the jacuzzi. the location is great, with 10 minutes walk to the Blue Church, and 20 minutes walk to the Fira town. The bathroom is so great that we showered almost twice a day to get full relax. The porter helped me with the luggage and really makes me feel at home. Dana villas is like you died and went to heaven. The views are indescribable, so I won't try to describe them. I will say it's better than any picture can capture. The service was amazing; they all treated us like family (special shoutout to Markos). The rooms are fit for royalty. Our wedding and stay there were even better than we could have possibly dreamed. It can only be described as MAGIC. The infinity room has a very nice indoor pool and sauna and jacuzzi inside the Infiniti pool overlooking the caldera. The room had 3 bathrooms with shower massages and excellent amenities for shower. Nespresso machine is always a plus. The room decoration and lighting was great. Speakers available. The staff was great. Very helpful with anything we asked for. They are very nice and polite. The room was exactly like the pictures online. We would definitely come back. Beautiful location, view, facilities and friendly staff. Athina and Nicole were always cheerful and willing to help to make our stay unforgetable. Very good location, reasonable fee, clean room and kind staffs. The staff were really friendly and always happy to help. Lock in a great price for Infinity Suites & Dana Villas – rated 9 by recent guests! Located in a peaceful area outside Fira’s center, Dana Villas offer views of the volcano and the famous Santorini sunset. The elegant rooms are decorated in the traditional Cycladic style. Dana Villas offers a variety of well-appointed suites and villas. Each is equipped with cable TV, air conditioning, safety deposit box and coffee making facilities, while most of the suites and villas include indoor heated plunge pools with hydromassage facilities, as well as outdoor private infinity pool. The hotel features a 70-m2 swimming pool with plenty of sun loungers. A hot tub and massage facilities are among the wellness options that Dana Villas offer. Villas Dana's restaurant overlooks the caldera and serves Greek and international specialties. The pool bar offers cocktails and smoothies. Room service is also provided. Guests have free Wi-Fi access and a 24-hour reception service. Upon charge, a minibus transfer to the port and the airport is provided during the summer season. Free public parking is possible at a location near Dana Villas. When would you like to stay at Infinity Suites & Dana Villas? Comfortable and chic, these modern suites offer exceptional views of the Caldera, Aegean Sea, volcanic island and the beautiful sunset. The bathroom offers large shower cabin facilities with double rain showers and windows facing towards the views through the room. The outdoor area is a private setting ideal for relaxing moments overlooking the Caldera view. These suites include heated outdoor plunge pool, that lead into an indoor cave plunge pool accessible also from the room’s shower cabins. Located in the highest part of the property, Honeymoon Suites offer unobstructed views of the caldera bay, volcanic island, the scenic cliffside traditional settlements and the breathtaking Santorini sunsets, while they are accessible only by steps. 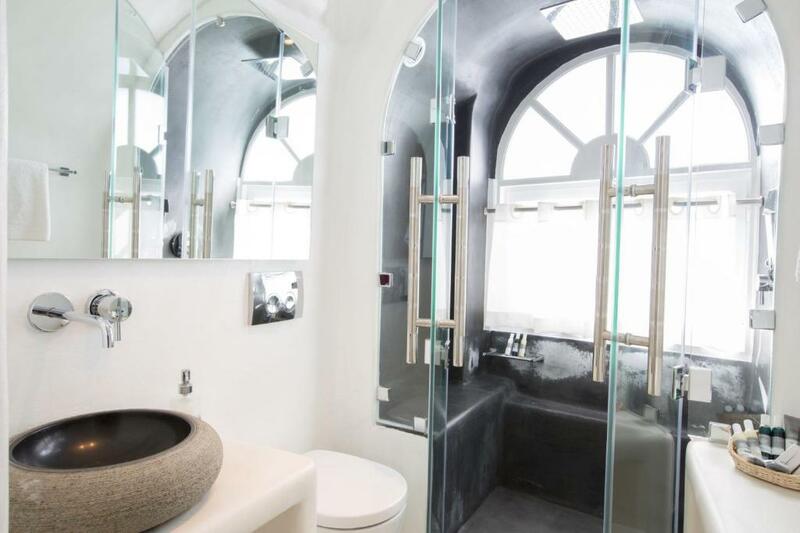 -an interior plunge pool with a spa bath for 6 guests, sound system and lighting control. -a bedroom with a king-size bed. -breathtaking views of the Santorini caldera and sunset. Infinity Suites feature elegant decoration, superb amenities, state-of-the-art facilities and a variety of impressive water playful elements indoors and outdoors. A modern bedroom, spacious living room and an outdoor private balcony are provided. They are located between two private heated pools; an outdoor infinity plunge pool with hydromassage facilities and an interior heated pool with hydromassage facilities, waterfall, active oxygen, sound speaker and smart lighting system. The outdoor infinity pool is accessible from the rooms interior, while the indoor heated pool is accessible from the bathroom. Led rain showers with wall water jets and a steam bath cabin electronically controlled are located in separate indoor areas of the Suite. They also offer fascinating views of the Caldera, Aegean Sea, volcanic island and the magical Santorini sunset. Spacious villa with modern Cycladic style and interior light bright colors. It includes living-room, dining-room, two bathrooms, two bedrooms and three sofa beds. An external infinity plunge pool with a double sun lounger is provided. It is a private setting with two separate entrances and private balconies ideal for relaxation, overlooking the stunning views of Caldera bay and magical sunset. The first entrance located within the hotel property and the second one (private) located in the external traditional path above the hotel. This split-level villa offers an ambient environment with modern Cycladic style and interior contemporary decoration. A spacious living-room, dining-room and bathroom are located in the ground floor, while the bedroom is located in the upper level. The outdoor private terrace provides comfortable sun loungers and guests may enjoy panoramic views over the Aegean Sea, Volcano and the breathtaking Santorini’s sunset. The Superior Pool Suite offers a bright airy atmosphere with stripped down interior style, according to the Cycladic architecture. The Suite is equipped with all necessary amenities for a comfortable stay, while a small lounge with one single sofa-bed and a king size bed are provided. The outdoor area is a private setting ideal for relaxing moments and breathtaking views of the Caldera, Aegean Sea, volcanic island and the beautiful sunset. An Infinity Plunge pool with hydromassage facilities and a double sun lounger are provided in the private balcony. The Double Deluxe rooms creates a sublime atmosphere of absolute comfort and relaxation, featuring a double bed and a private balcony overlooking the Caldera, Aegean Sea and the volcano. The bathroom offers large shower cabin facilities with double rain showers and windows facing towards the views through the room. The balconies offer maximum privacy, while double loungers and sofas are provided. Designed in air bright colors and minimal Cycladic style, the Senior Suites are built on two levels in an open-plan suite style. They have their own private secluded terrace with double sun loungers and lounge area. The bathroom comes with large shower facilities with double rain showers and windows facing towards the fascinating views through the suite. The Superior Suites are designed with stylish decorative details creating a delightful atmosphere. They feature a separate bedroom with one double bed and a living room with two single beds. The bathroom comes with large shower facilities with double rain showers. The private balcony offers breathtaking views of the Caldera, Aegean Sea and the volcano, while double loungers and sofas are provided. Designed in bright and airy colors and minimal Cycladic style, these suites feature two separate bedrooms and a private balcony overlooking the Caldera, Aegean Sea and the volcano. The Master Pool Suites offer a new fun concept for multiple guest accommodations in combination with a very unique outdoor plunge pool design concept for joyful moments. The Infinity Villa consists of two separate bedrooms, two lounges, three bathrooms with Led rain showers, two steam baths, two interior heated pools and two exterior infinity plunge pools with hydromassage facilities. All lighting is electronically controlled by smart controls and interior pools have different led lighting options, high sound isolation and sound systems. Interior pools use active oxygen (not chlorine) for an unforgettable swimming experience. The Villa is located on an entire isolated level accessed by a private door from the level above. Infinity Suites - Dana Villas & Suites is located in a unique location on the Firostefani cliffside in direct view of the amazing Santorini scenery. The way our property is built offers views from each and every room type and all of our outdoor facilities. We are embrased by a beuatiful cliffside town with traditional white washed buildings built with in the unique Santorini architectural way. Our hotel offers 11 room categories in two sections which our hotel and exclusive suite section offering a large choice of rooms,suites and villas for all our guests to choose from. Infinity Suites - Dana Villas & Suites is one of the most peacefull properties in Firostefani as we are located at a peacfull distnce from the main paths at the top of the cliffside and this offers our guests a peaceful ,quiet and relaxing cliffside experience. Our property is open through the year and even in the winter months our hotel offers accommodation and enjoyable heated jacuzzi for all guests. guests in the winter months that may prefer a suite or Villa in our exclusive section will enjoy the views from their private pool or jacuzzi that are also heated. The cliffside town of Firostefani is one of the island's most unique areas as it combined close proximity to the island's capitol (600meters) but is at the same time a very peaceful area even in peak season due to that Firostefani is consisted of peaceful hotels and relaxing restaurants. The entire town faces west and is in direct view of the Sunset, caldera bay, volcanic island combined with views of the Skaros rock, most of the island's cliffside and the Aegean Islands in the western horizon. House Rules Infinity Suites & Dana Villas takes special requests – add in the next step! All children or adults are charged EUR 25 per person per night for extra beds. Infinity Suites &amp; Dana Villas accepts these cards and reserves the right to temporarily hold an amount prior to arrival. Infinity Suites & Dana Villas accepts these cards and reserves the right to temporarily hold an amount prior to arrival. Due to the unique geography of Santorini and Dana Villas privileged location on its cliff-side, there are a number of steps leading to the property and its rooms. Porters are on hand to help you with your luggage. Please inform Infinity Suites & Dana Villas of your expected arrival time in advance. You can use the Special Requests box when booking, or contact the property directly using the contact details in your confirmation. No pool restaurant, we had received an email advising of work being undertaken but that it would be finished before our arrival. But noisy work and no restaurant. Breakfast food like bacon, sausages, eggs etc was always freezing cold! Fridge didn’t work so no cold drinks in room. Sound system out dated, need wireless ones, they said going to change soon. Food reaching the room cold, mybe need microwave in the room. One of the best Hotels ever, well recommend, must get the honeymoon villa or suite , strong Management and the service was very quick they made sure to provide all our needs. If you plan to visit Santorini make sure to book this hotel.... definitely we will visit this hotel again. Great staff very friendly and attentive. We loved everything about the hotel including our room and the service provided. Stayed in the honeymoon suite with wonderful beautiful view. Upon arrival was greeted by a friendly receptionists and staffs. Flight was early morning so our room was not ready yet. Receptionists was helpful in recommending a cafe that is open and showed the route. When we finally got into our room we hadn’t slept in nearly 24 hours and there was extremely loud drilling above our room. It was so loud we couldn’t hear ourselves speak. I had to complain to the reception a few times. A lot of the room was outdated and required updating (painting, refurbishing etc). Alongside this, on the first day after sleeping we woke up to find a massive pile of ants in the middle of our room. For a four star hotel this is not acceptable. You can see this in the pictures I attached. In addition to this, there was something wrong with our key and the door wouldn’t open sometimes so we had to walk all the way up the stairs to reception to resolve this and someone would come and open our room. I have to say I was overall disappointed with the quality for the price we paid. For a 4 star hotel I would not expect the room to be of this low standard. People should bare this in mind when booking the hotel. Some of the pictures are quite deceptive. I really loved the view and the infinity pools they were worth the travel to Santorini. The staff were also extremely helpful and supportive. For the value of the money, I was disappointed with many aspects starting with the defensive attitude of the staff when asking for something or informing them of an issue we have. Thank you. Did not get the room with hot tub. Breakfast was a little cold . But with the winter weather and this property is big and spread out, I can understand. View from terrace, great overall experience .